Listed below are testimonials we have received from existing clients. A very sincere thank you to you all for guiding us so gently through the decisions regarding our choice of solar panels and their installation. Each of you really listened to us, went out of your way to oblige us, and Andy and Luke were meticulous in planning the best and neatest arrangement. 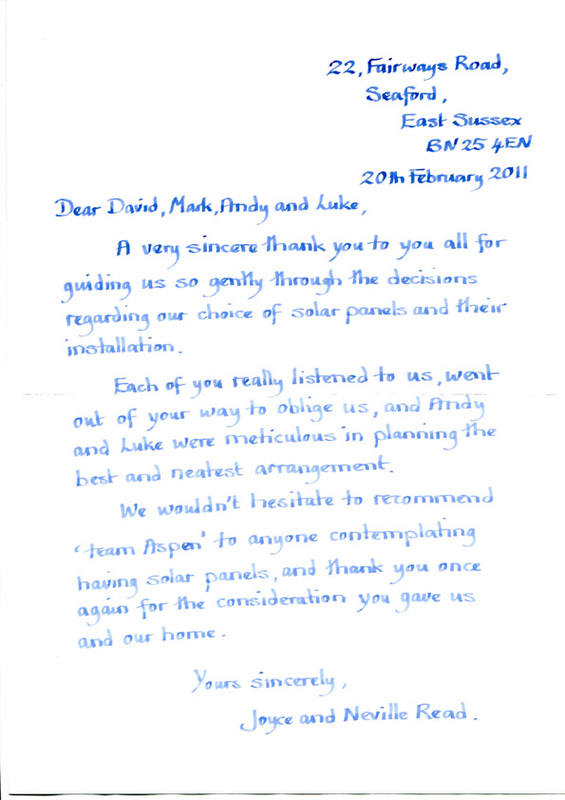 We wouldn't hesitate to recommend 'Team Aspen' to anyone contemplating having solar panels, and thank you once again for the consideration you gave us and our home. 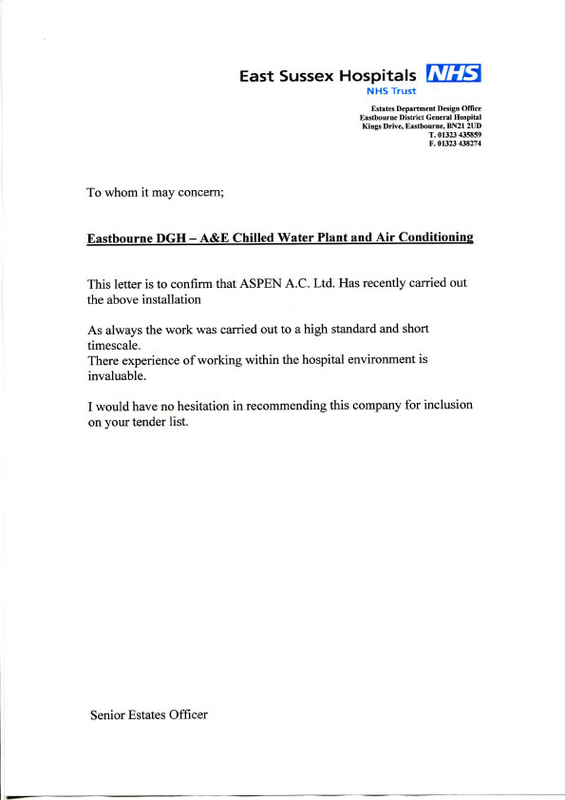 Eastbourne DGH - A&E Chilled Water Plant and Air Conditioning. 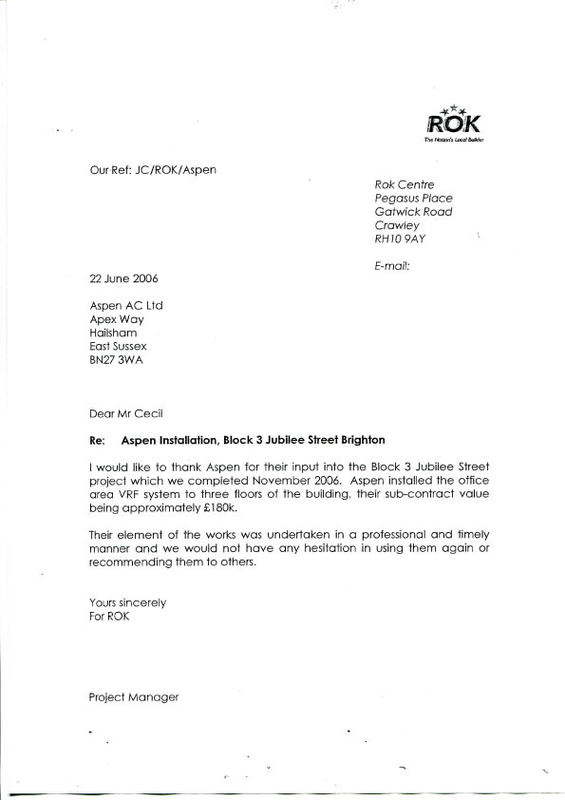 This letter is to confirm that ASPEN A.C. Ltd. Has recently carried out the above installation. As always the work was carried out to a high standard and short time scale. Their experience of working within the hospital environment is invaluable. I would have no hesitation in recommending this company for inclusion on you tender list." "I would like to thank Aspen for their input into the Block 3 Jubilee Street project which we completed November 2006. Aspen installed the office area VRF system to three floors of the building, their sub-contract value being approximately £180k. Their element of the works was undertaken in a professional and timely manner and we would not have any hesitation in using them again or recommending them to others." RE: Reference for Aspen AC Limited. 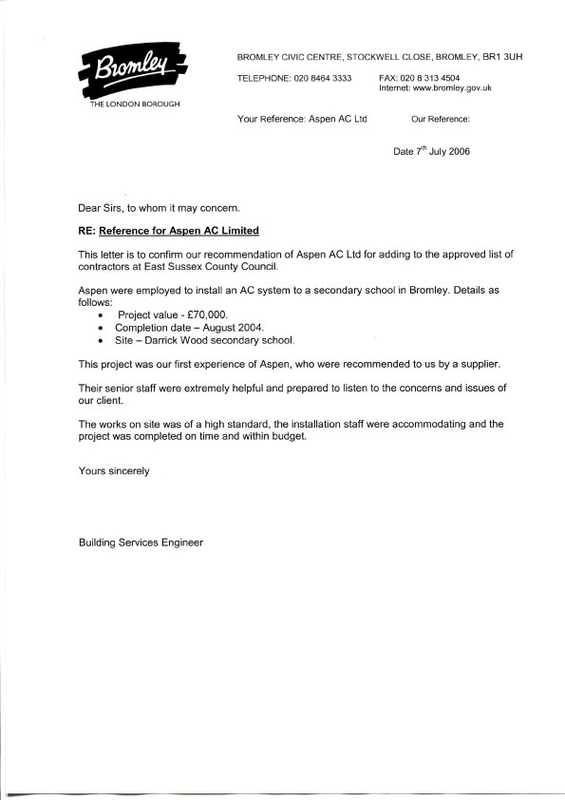 This letter is to confirm our recommendation of Aspen AC Ltd for adding to the approved list of contractors at East Sussex County Council. Project Value - £70 000. Completion Date - August 2004. Site - Darrick Wood Secondary School. This project was our first experience of Aspen, who were recommended to us by supplier. Their senior staff were extremely helpful and prepared to listen to the concerns and issues of our client. The works on the site was of a high standard, the installation staff were accommodating and the project was completed on time and within budget."